This Wilton cake decorating frosting is great for someone who wishes to have a pure white icing. Royal icing is also pure white but it hardens as it dries, it can be used in a variety of ways to decorate and frost. 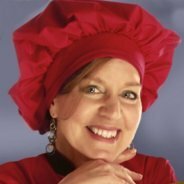 This recipe is shown first and there is a tutorial in video format for you to follow. The photo below is a close up of my sister in laws bridal cake. The royal icing recipe is pure white, but not often used as an icing on a cake (at least not in the U.S.) but It's perfect for piping royal icing flowers that can be mounted on wire, lace, lattice , leaves, snowflakes, borders and string work. 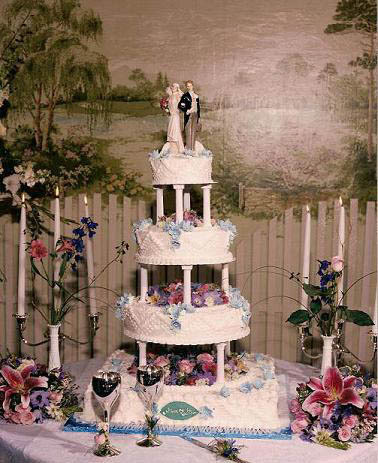 The flowers in this photo were made with pastel colored royal icing, mounted on toothpicks and dried overnight. A Styrofoam half ball was used as the base. 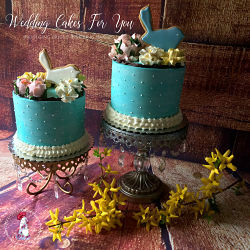 The bunnies are held on with a dab of the frosting, and the flowers pushed into the Styrofoam. My video will show you the steps to making royal icing. It's not difficult at all. The only trick is keeping it from drying out. The recipe is written for you below the video. Combine all ingredients, beat at high speed for 2 minutes. Keep covered with a damp cloth, the icing dries very quickly. 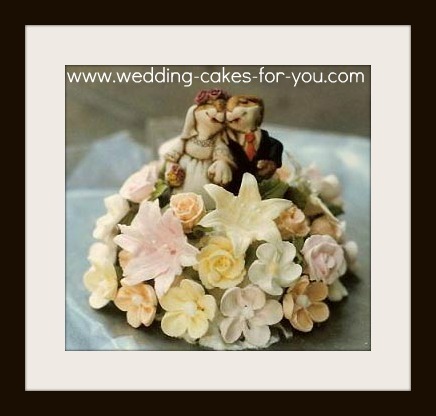 Snowflakes, lace or any type of three dimensional decoration can be made using this amazing cake decorating frosting. In the video I show you how to make snowflakes but this technique can be applied to any other design. For example, letters or other objects) use your imagination. 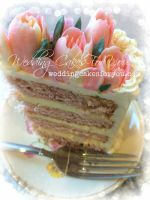 You can use Wilton meringue powder for this cake decorating frosting recipe and it can be restored as long as you keep it in an air tight container and bring it to room temperature before re-beating. Combine all ingredient, mixing slowly, then beat at high speed for 7-10 minutes. Keep covered with a damp cloth, icing dries quickly. Store tightly, covered, in a refrigerator for weeks. 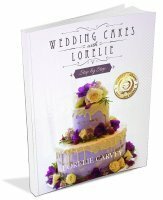 Read some of the suggestion for an alternative no fail royal recipe and other helpful ideas for using this fantastic icing by visitors of Wedding Cakes For you. 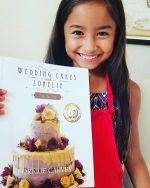 To see the classic Wilton icing please visit their website. 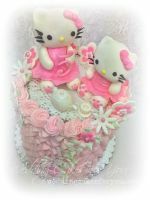 The design below was straight from the Wilton Cake Decorating books. 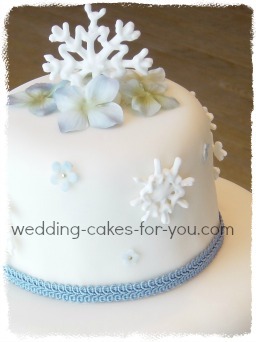 The blue flowers are made with royal icing.